This Christmas season is all about using what I already have in my stashes. I buy cool Christmas stuff at thrift stores during the Christmas season and then it gets put away and I forget about it. Then I buy cool Christmas stuff at garage sales during the summer, and it too gets put away and I forget about it. lol. Well this year I’ve pulled everything out, and I do mean everything, so that I can see it all. Needless to say my craft studio is one big creative Christmassy mess. lol. But for now it’s me and this little room packed with Christmas treasure, and I have to pick and choose what to use in projects this year. So, time to take down my diy Repurposed Owl Fall Door Decoration, and put up something for the Christmas season. I was kinda sad to see my owl go so I needed something really fabulous and colorful to replace him. 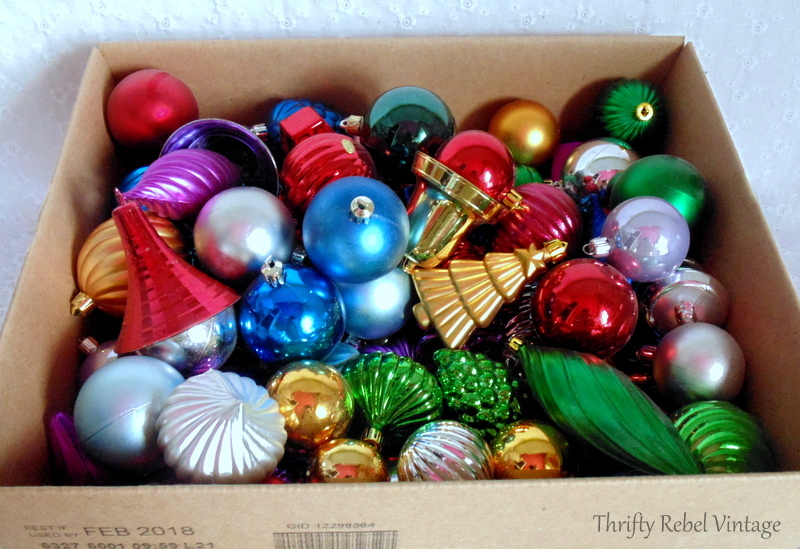 The first thing that really caught my fancy was this large $2 box of colorful plastic ornaments that I bought at a yard sale years ago. They’ve been stashed away in a bookcase below my computer desk and honestly I didn’t even remember that I had them. 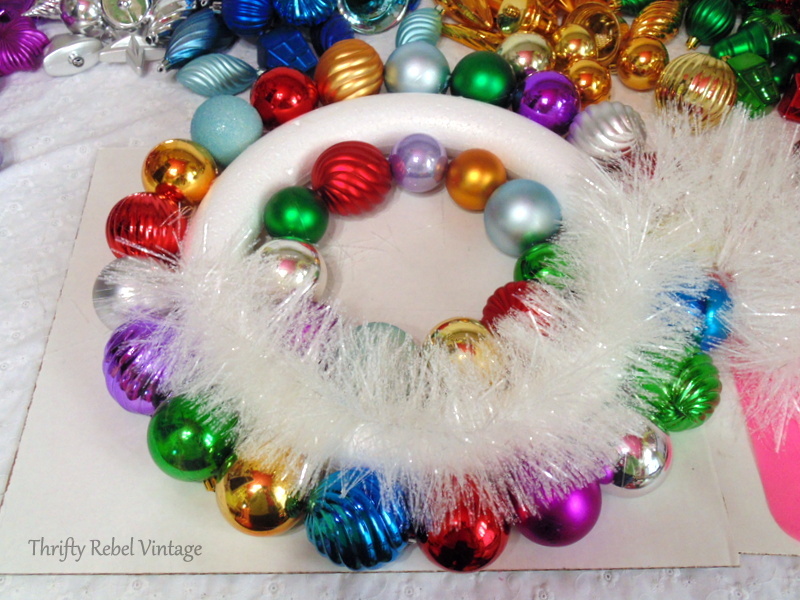 I have a stash of thrifted wreath forms of all kinds; twig, straw, styrofoam, plastic. You name it and I’ve probably got it. 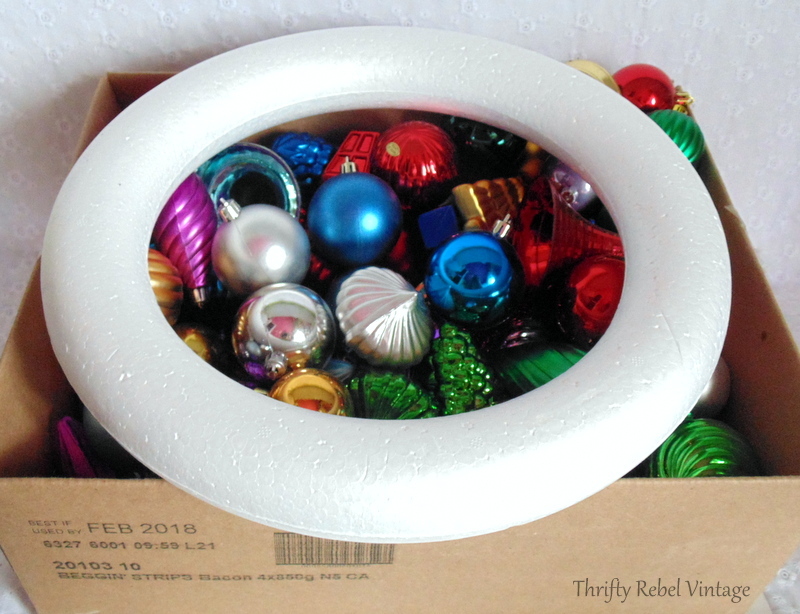 I store them all up and out of the way on my diy wreath hanger. I buy them whenever I see them and usually pay 50 cents to $1. 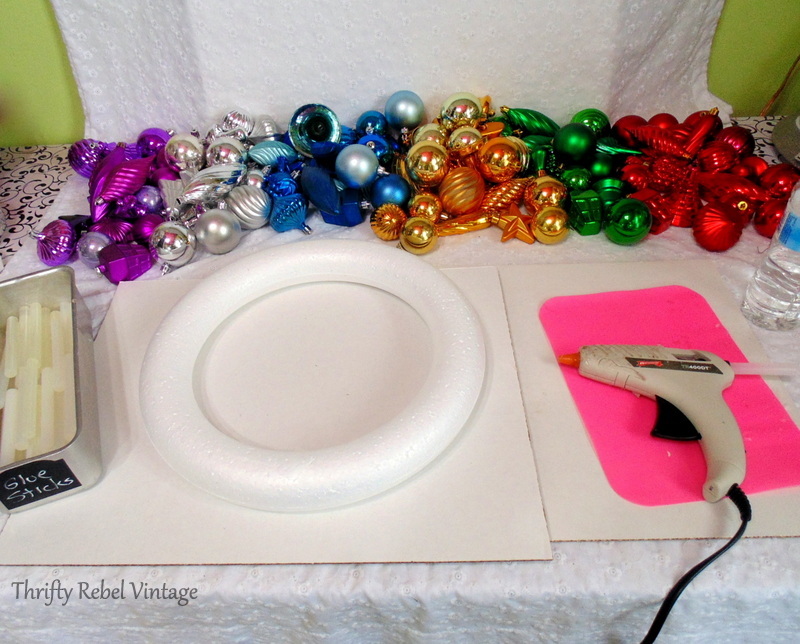 I’m using a 12″ styrofoam wreath form for this project. 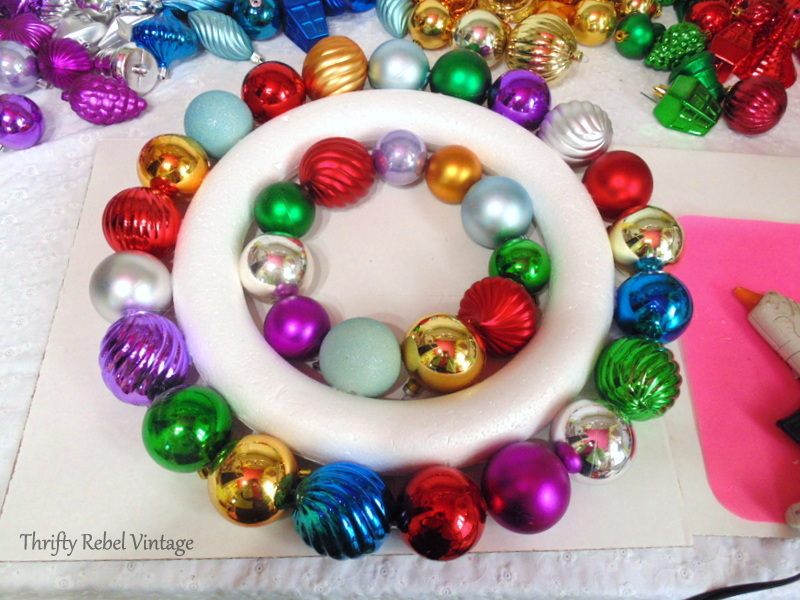 The first thing I did to start creating my diy Christmas ornament wreath was put all the ornaments in piles by color. This makes it much easier to see what you have to work with. All I needed for this project was my handy dandy glue gun. It’s been years, like over 20, since I’ve made a Christmas ornament wreath. But after being momentarily intimidated by all those ornaments I quickly remembered how easy it actually is. To make sure you have the right ornaments to fit around the outside and inside of the wreath it’s a good idea to do a dry fit. This way when you’re almost done you know you won’t be left with a space that you don’t have an ornament to fit. Once you’re happy with your dry fit you can go ahead and glue all the ornaments in place. I didn’t want to see the tops where the hangers are so I faced those all down, but that’s just a personal choice. Once all my ornaments were glued down around the sides I decided I wanted something more than just the ornaments on the front of my wreath. One thing I especially love about crafting and repurposing is the fun of improvising as I go by looking at what I have to use. In my garland stash I found a lovely white sparkly garland, and I glued it on the top of the styrofoam form. 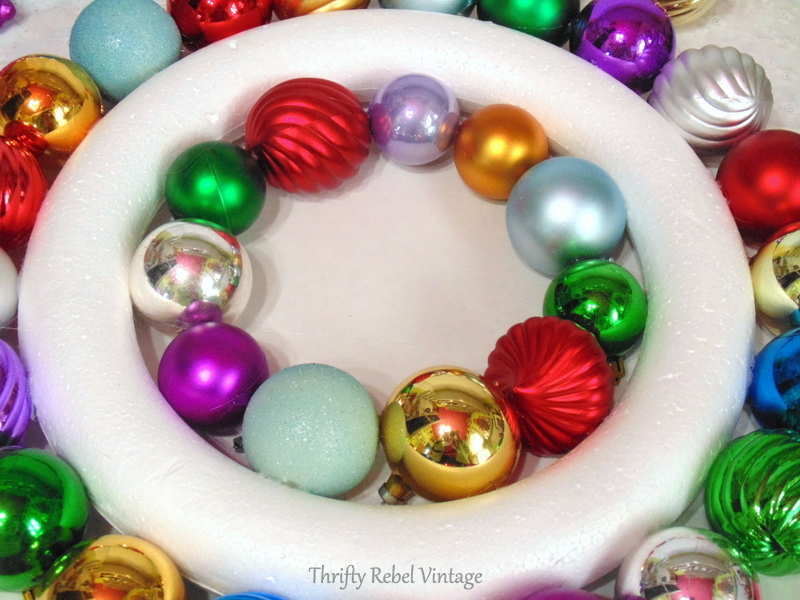 Not only does it look pretty, but it also stops the styrofoam from peeking through the ornaments. Then I just started placing and gluing ornaments on top, not worrying about placement one little bit, but just winging it. Here’s what the back looks like. You can see all the tops that I didn’t want showing at the front. 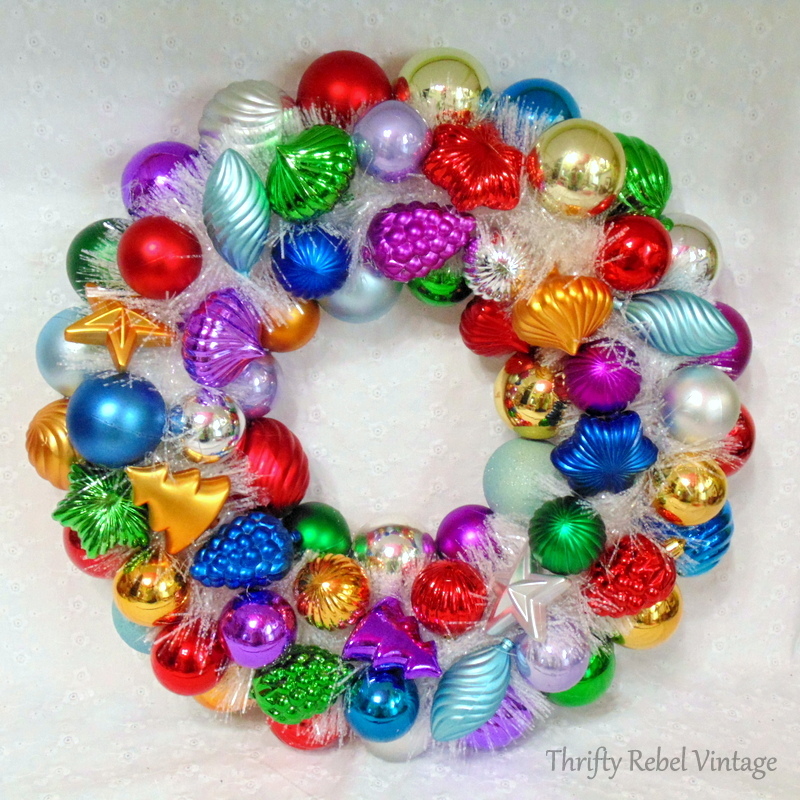 My finished Christmas ornament wreath is about 18″ across. I ran out of ball ornaments so I just started adding other shaped ornaments that fit the spaces that I had. Turns out that was a good thing because I think they add a little more interest to the wreath. I left spaces between the ornaments on purpose to let that white sparkly garland shine through. It really is a lovely backdrop for the colorful ornaments. To hang my Christmas ornament wreath I poked some copper wire through the ornaments around the wreath form and made a hooky thing. 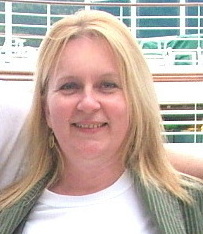 You could do this first if you want, but I wasn’t sure where I was going to want my top to be so I left it to last. 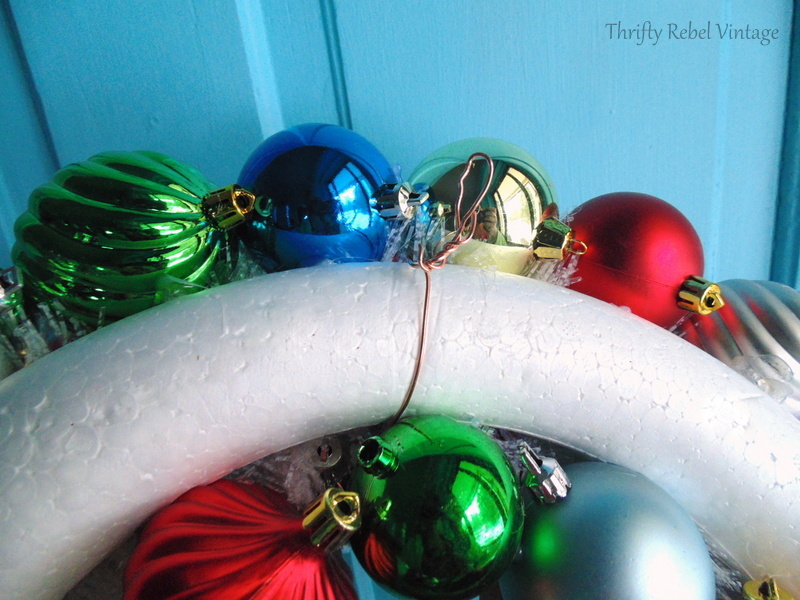 This wreath is really quite light so you can use any type of wire or twine for hanging. 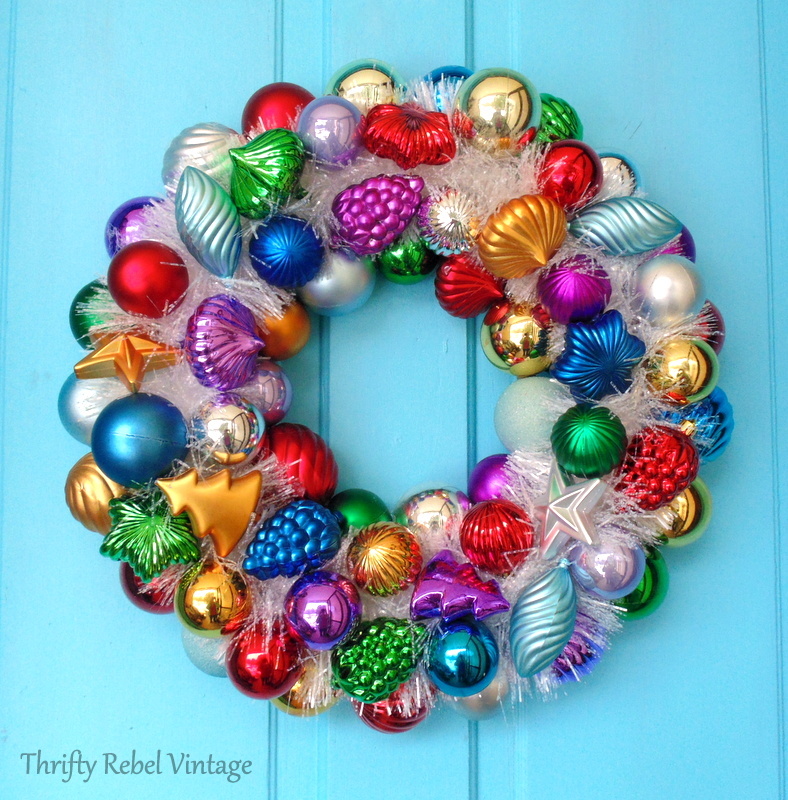 And here’s my Christmas ornament wreath on our kitchen front door, which is the door that is always used. Honestly, you would never know the ornaments are plastic unless you studied them really closely, or touched them. They are so colorful and fabulous. I have to say that using inexpensive plastic ornaments made this a really fun and freeing creative experience. This project cost me just $3, and I finished the wreath in just over an hour. A Christmas ornament wreath can be a little intimidating to think about making, especially with all those ornaments laid out in front of you. But trust me when I say that it’s really quite easy, and the result can be quite amazing. Any color combo would work, or even the same color with different ornament textures would be fabulous. The possibilities are endless really. Put the idea of perfection aside and just go for it. Perfect things are made by machines. 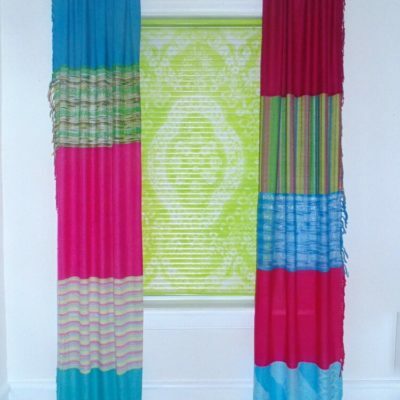 Handmade things made by people like you and me are much more interesting than that. That looks great! The garland and the interesting shapes take this wreath to a new level 🙂 I love all of the cheerful colors. Thanks very much Candy. Merry Christmas to you! I’ve seen a lot of Christmas ornament wreathes but this one is really special because of the garland and old fashioned looking ornaments. It is one of a kind. Thanks very much Betty! I’m so glad I decided to add the garland. It’s so pretty. Thanks Sharon! 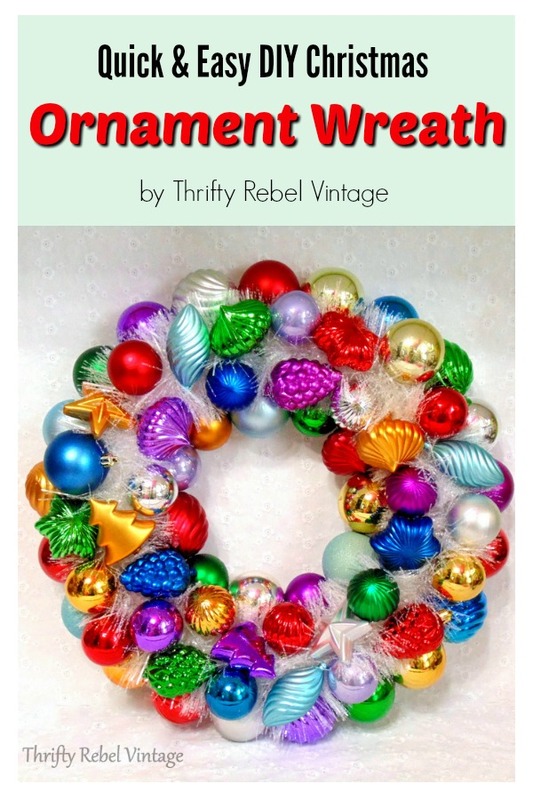 For a project like this for me plastic ornaments are a definite. 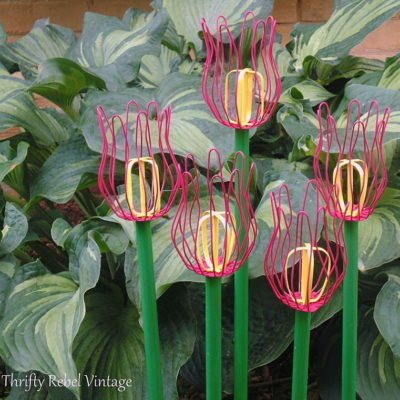 I’m not sure I would ever want to make them with glass, although I’ve seen some beautiful ones. I’ve been wanting to make one of these for a long time. I am now inspired to actually make one. What a great assortment of ornaments you got for $2! I had thought of using my moms old ornaments but they are so sentimental to me I still use them on my tree. They are also probably too fragile for a wreath. Yours came out so pretty and I love the idea of the garland. Hope you have a very Merry Christmas! This is very pretty! 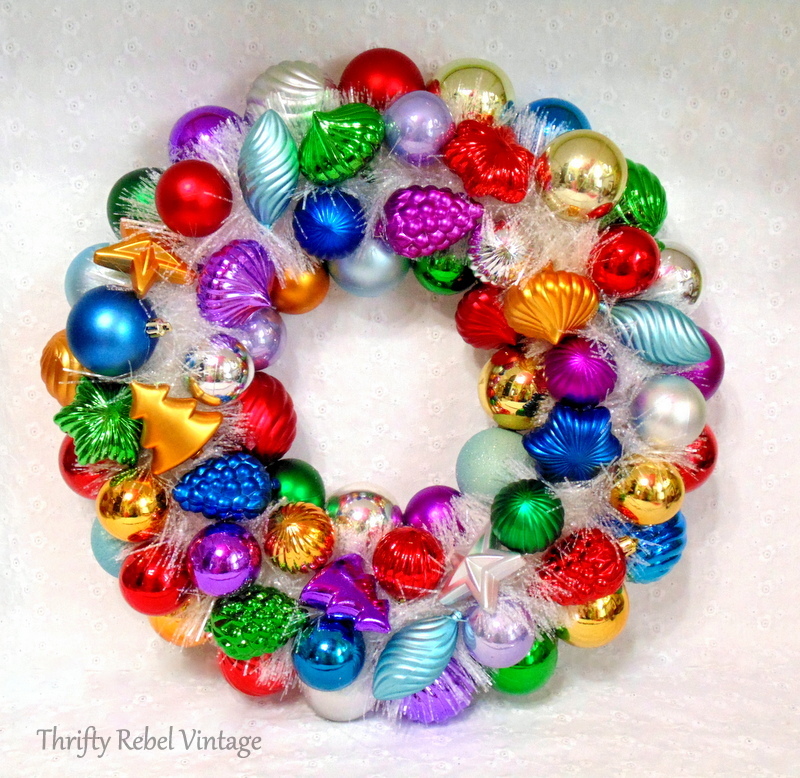 The vintage ornaments make this into a beautiful wreath. Thanks very much Jill! The ornaments definitely have a vintage look. Love it. Don’t have all the stuff, but probably wouldn’t be too expensive to buy new and make. Thanks for sharing. Thanks Pam! You’re so right. I don’t think plastic ornaments are too expensive new. Thanks so much Debbie. You’re so welcome! It’s beautiful! I just love all the things you do. Thank you so much for giving all of us your ideas. Love it! The different shaped ornaments really add a lot to it. Thank you for sharing. Thanks very much Annette. You’re so welcome! It’s so pretty Tuula! You’ve inspired me to make one if I can find enough of the right ingredients! Thanks Florence! 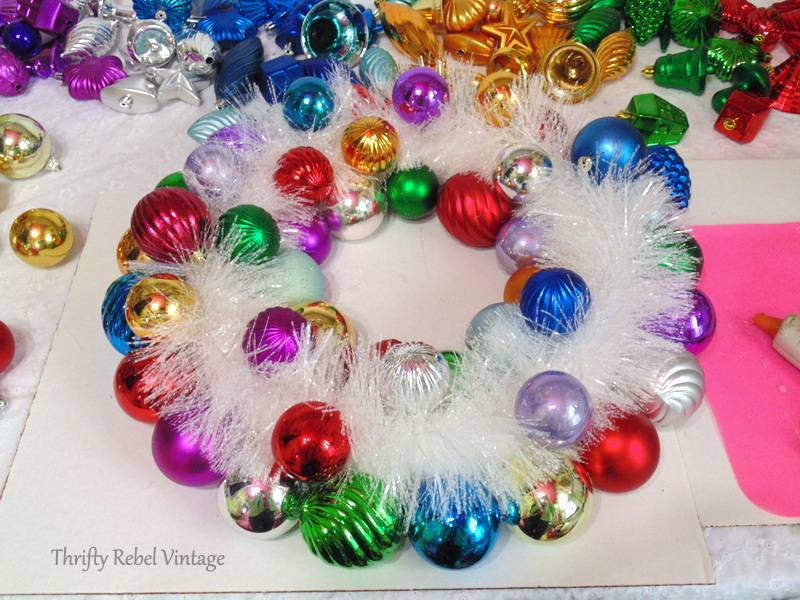 It was so fun to make, and with plastic ornaments these no worries about breakage and no regrets about using special ornaments. 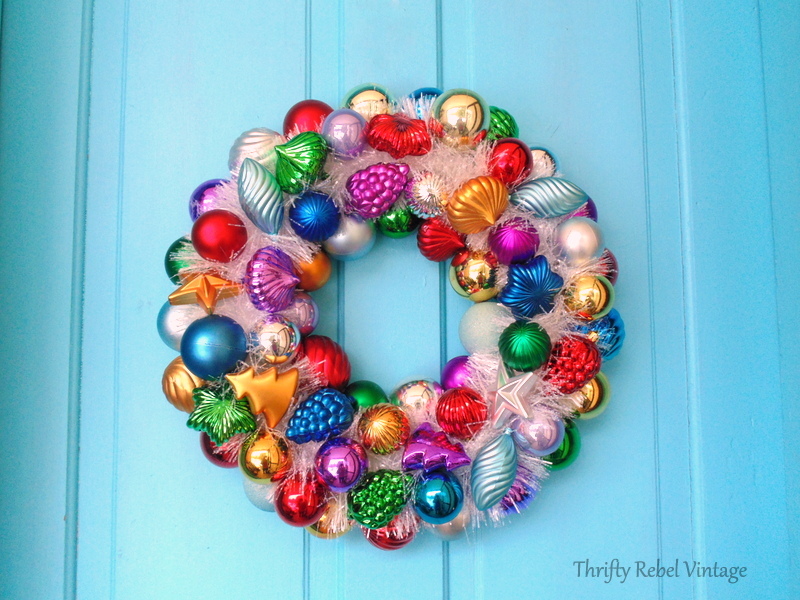 I think I just want this kind of wreath to look pretty, and I’ll display my special ornaments in other ways.